There are 681 posts in this topic. You are on page 13 of 14. CPR needs 100 pre-orders before they enter a playfield into production. So it could be forever if there are not 100 people who need that playfield. No production updates? Just bizarre to me, especially in the 'Official' thread. Just guessing but Hardtops are a side business and I think they said they recently moved. Getting the primary business back to 100% is probably taking up all the spare time that Hardtops require. Darn it!!!! You are correct. I was told HS is close but telling you all that isnt going to help much. I promise to let you know as soon as I recieve the prototype. 1 - The entire topside is now torn down with everything removed, including the four pop bumpers. Each of the pop bumper areas has mylar - I removed one easily enough by pulling it up with my fingers but it left a tacky residue. What's the best way to remove the mylar? Does the tacky residue have to be remedied before laying down the hardtop and, if so, how is that done? 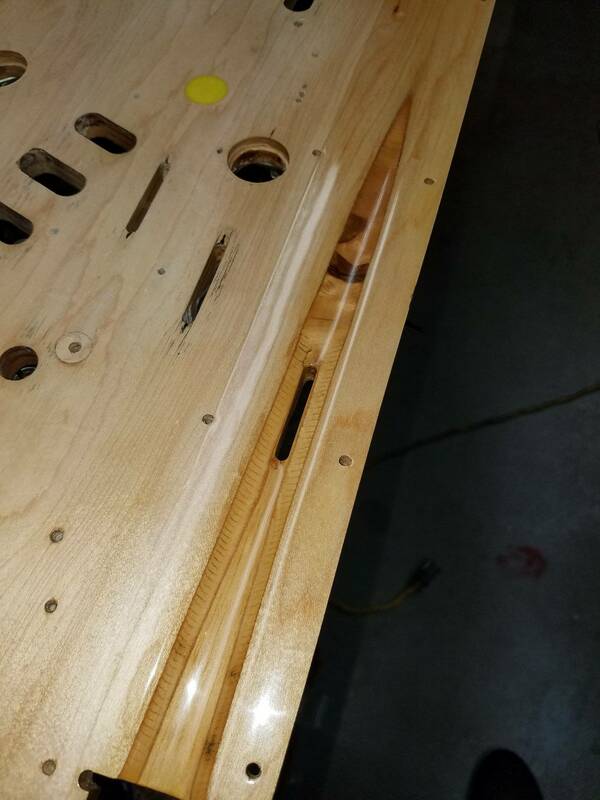 2 - Some of the recommendations I've read involve spraying "clear" on the inserts after sanding them down and on the bare wood areas as well that surround the playfield, including the shooter lane (and then waiting at least 72hrs before laying down the hardtop). What do you guys do, and where does one get "spray clear"? Something easily enough picked up at Home Depot or Lowes? What do I look for? 3 - I should sand down only the "rough" areas, inserts, and anywhere there are protrusions, correct? Never done this before....what grit sandpaper should I use? 200, then 500, then 1000? When the area in question is smooth, I'm done? Great link, thank you eagle18. Vid's guides, as usual, are extremely detailed and informative and indeed it answered a lot of my questions (and provided tips I didn't even think about). 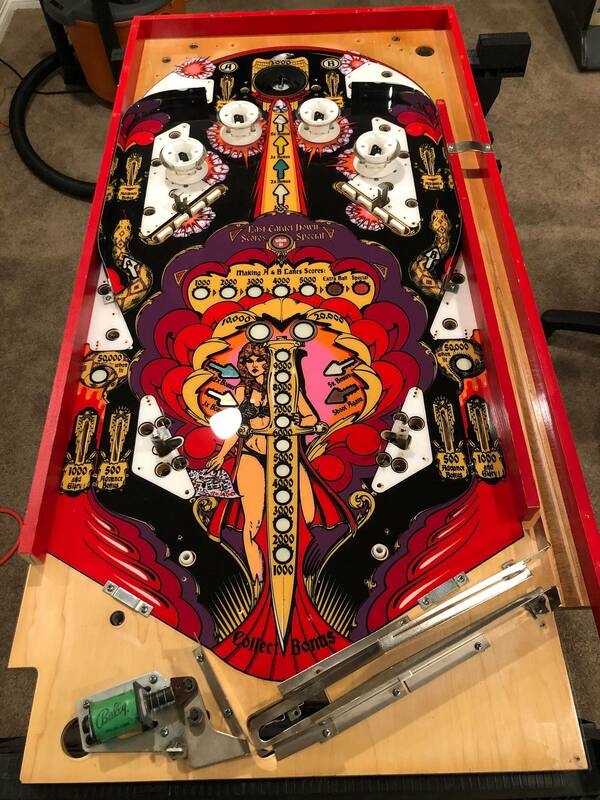 In his installation, however, he sanded off ALL artwork and cleared his entire playfield with 2PAC before applying the hardtop. I didn't think you had to go that far with hardtop installations. I'm just a basic hobbyist...I'm not set up or experienced enough to do a home 2PAC job with compressed air, chemical mask, bunny suit, paint booth, etc. For the rest of you guys who have installed hardtops...what did you do to clear the inserts, shooter lane, and saucers? Rattle can clear? What brand? I sanded all the artwork off (palm sander) 80 grit then 150 grit then 220 grit. Fortunately I could do it outside in January. Didn’t take long. Then I hand sanded all the inserts with 220 to get them cleaned up and flat to the playfield. A lot of guys go to 1000-2500 grit on this. Mine turned out fine IMO. Hand sanded the shooter lane with the 220 also. My shooter lane wasn’t too bad. 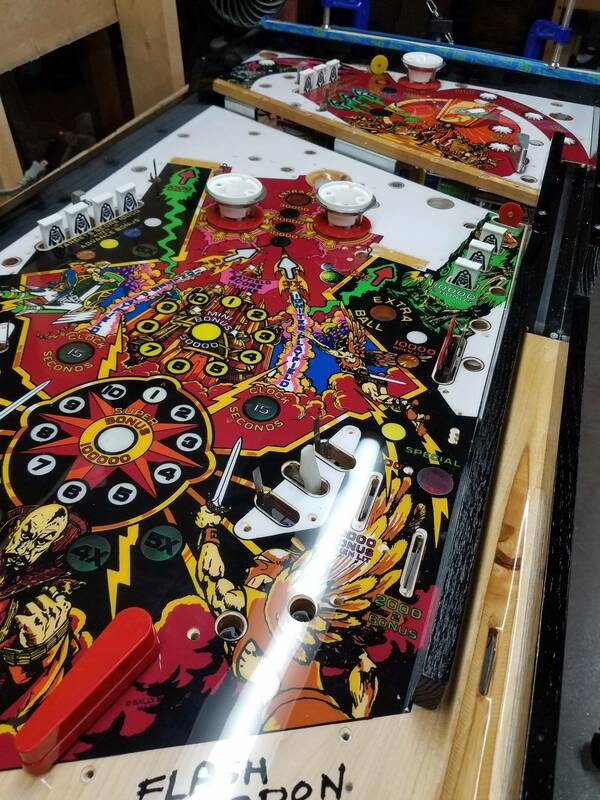 I then did 3 coats of Rustoleum rattle can clear on the entire playfield. I’m fortunate to have a heated shop to do this in January in Virginia. I let it sit for 3 days, then hand sanded with 600 grit to smooth out, vacuumed and wiped with tact rag, then applied the hardtop. Worked out great IMO. I made sure all inserts were flat and did not worry about the cupped ones. The Hardtop is great. Smooth as a pool table. If u miss a shot it’s your fault. Lol. Here is a couple of hardtop installs that did not use 2pac. For those that do not have a pro paint booth. I just used rattle can clear on shooter lane and inserts. I did use 2Pac on the shooter lane. I sanded off all the playfield to make sure everything was clean, with 220 on an orbital palm sander. I originally tried to clear my inserts with Rust-Oleum 2X after sanding out with 400, but the crazing my inserts had continued to hold contaminants after vigorous cleaning which fish eyed everything. I ultimately replaced all my clear inserts and decided to sand them all out to 2000 grit and then buffed them out. Then I installed the hardtop. I wanted to clear the inserts so I didn't have to send them out, but did not want to take the chance that I might have fish eyes for whatever reason. A bit of good news for some of you waiting. I got a call this morning that High Speed Proto is complete and should be in my hands soon for testing.Before anyone starts sanding down their playfields,remember this is just a prototype. If its not correct we take a step backwards. Keep your fingers crossed. Fingers crossed. Thanks for the update. Lots of inserts right there in the middle that have to line up. Any idea when pinbot will be a go? Great news! Still a lot of work to do on my HS, but I’m definitely going to need this! So where might FIRE! fall in the grey area of was a CPR field, but not so much any more... can a hardtop be made? I got 2 Swords of Fury games ready to go! I hope that one is next up. I also hope it is soon! lol. Question on hardtop hole alignment. I'm doing an alignment test fit with Mata Hari - inserts line up great as do most holes. There are a few holes, however, that are way off. Looking for guidance on how to rectify. Best example would be the holes for apron clip brackets. See the close up picture below where I have the hardtop slightly lifted so you can see the playfield underneath. On the hardtop, the holes for screws are BELOW the artwork line. 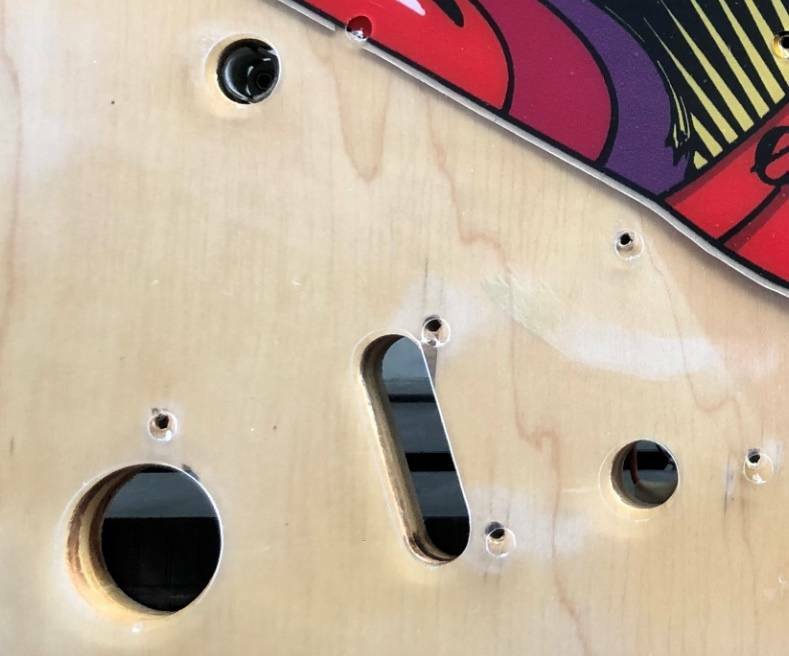 On the playfield itself, the holes for them are ABOVE the artwork line. 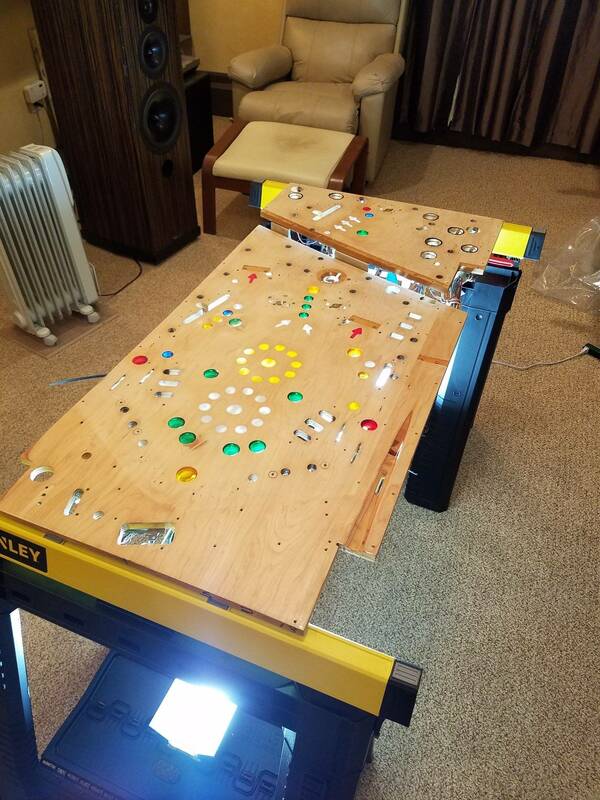 I'm assuming I need to drill holes thru the hardtop to match the existing holes in the playfield, correct? 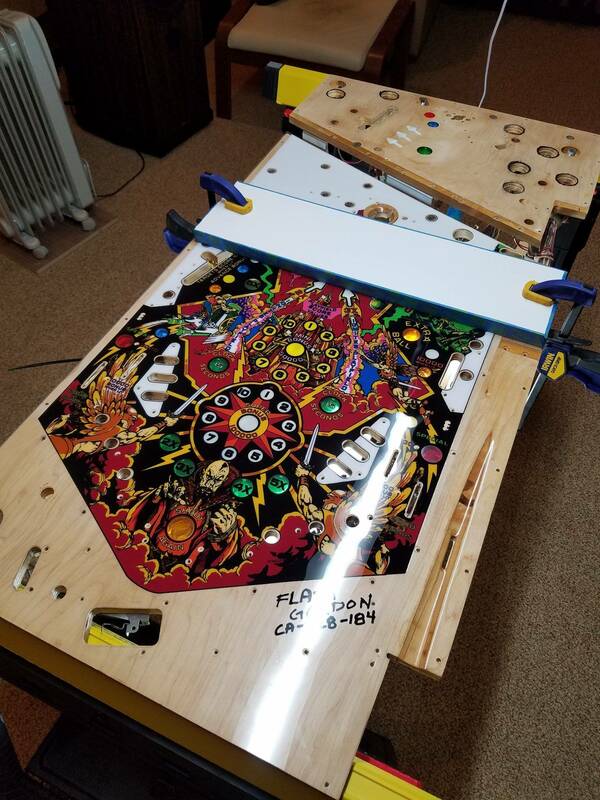 Any advice on how to determine exactly where on the hardtop to drill the holes since the original holes on the playfield cannot be seen thru the hardtop? Use a Dremel to carefully open existing holes in hardtop or drill new ones. You will have to do that for pretty much all of them. Wait until after you install to mess with the holes, btw. In my BK hardtop series I mention that with these games many of the holes were hand drilled. (that means there will be inconsistencies) Not every PF will be the same nor will they match EXACTLY with a hardtop. But it will be damn close! Just like Spraynard stated - don't drill holes in that HT til you have it permanently down on the PF. If the holes go all the way through the other side of the PF you can carefully drill starting on the other side using a very small drill bit to give you a pilot hole so you can flip it back over and drill down the correct way. I have a friend waiting on one as well. thecapn / spraynard - thanx for the input....that's pretty much what I thought. 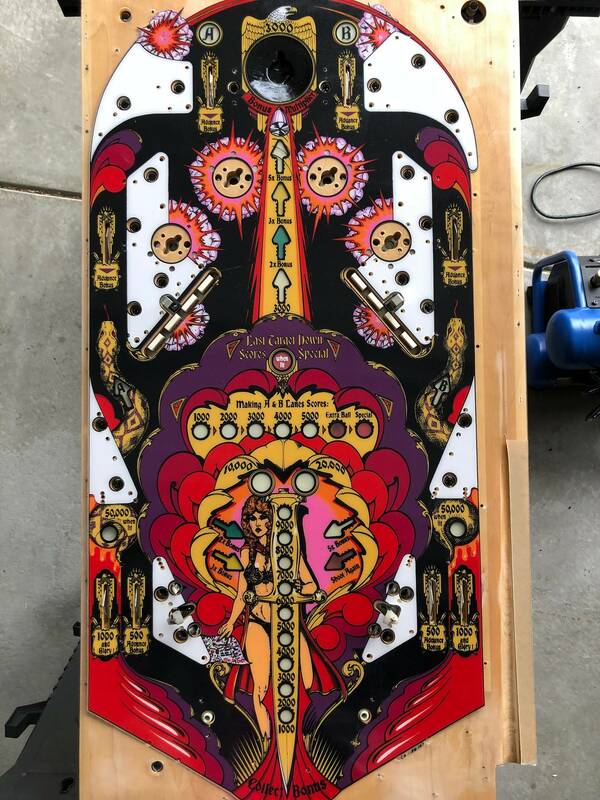 My challenge with those apron screw holes is that they do not go all the way thru the playfield which means I cannot drill up thru the bottom of the playfield after the hardtop is installed. 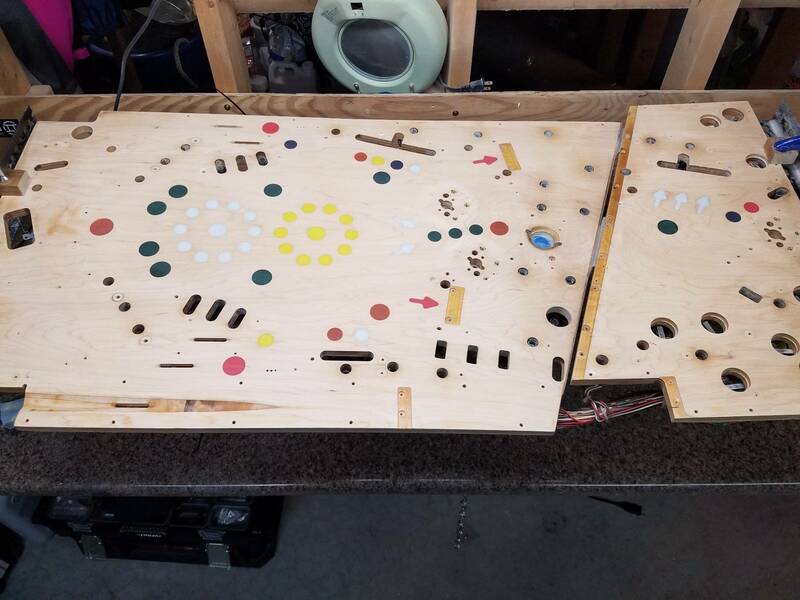 I guess I'm going to have to rely on measurements I make for the existing hardtop holes to approximate the location of the playfield holes from topside after the hardtop is installed? 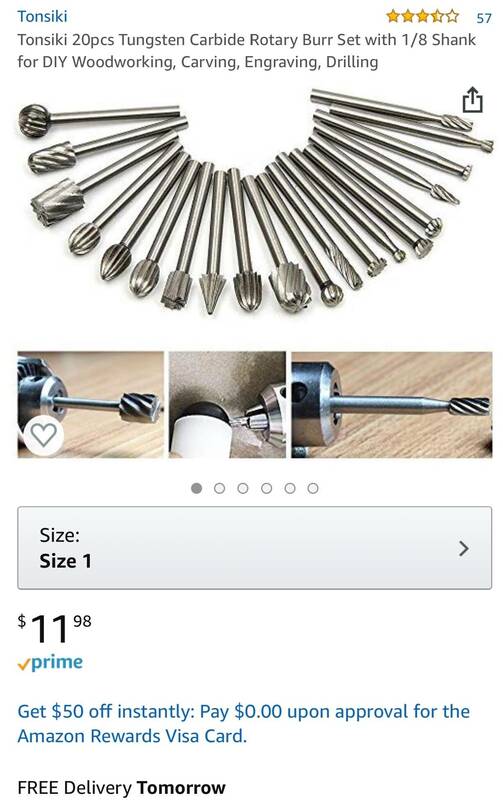 I was hoping there was a method other folks used when they encountered this situation instead of having to rely on measuring and doing a blind drill. Or I could try using the holes already in the hardtop...the apron itself would cover any mistakes provided it's still aligned on the playfield ok. 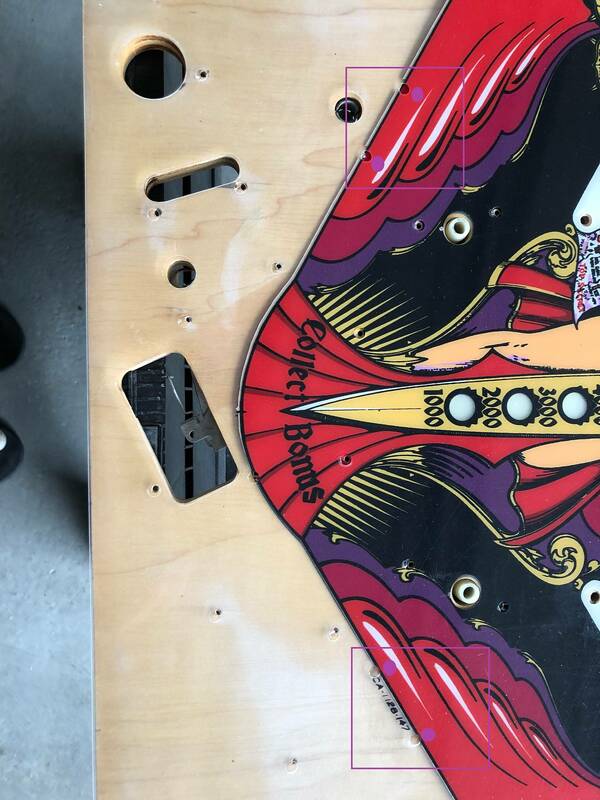 In the photo below, the purple dots represent an approximation for where the holes are drilled in the playfield. For the other holes close but not perfect - I've got a Dremel tool but only cutting disks. What bits/attachments would you recommend to use for opening up existing hardtop holes? 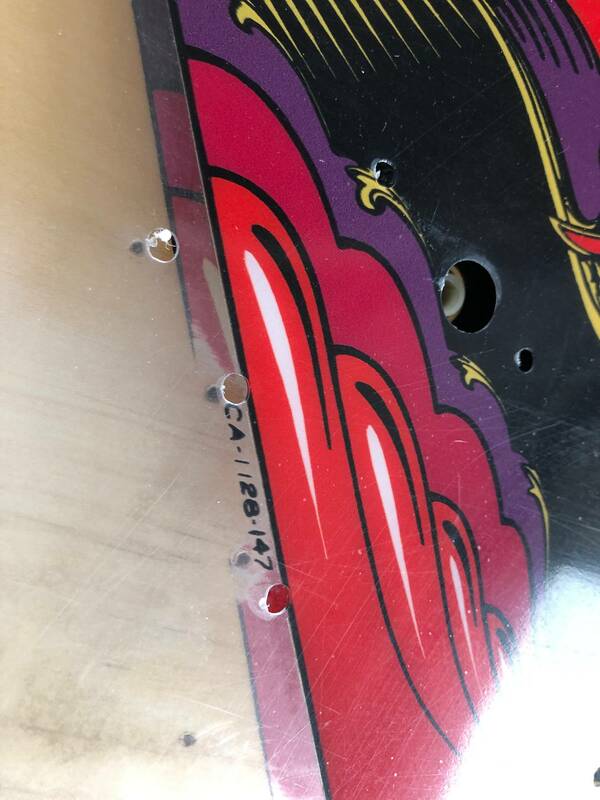 Is there anything under the playfield holes on the bottom side of the playfield? 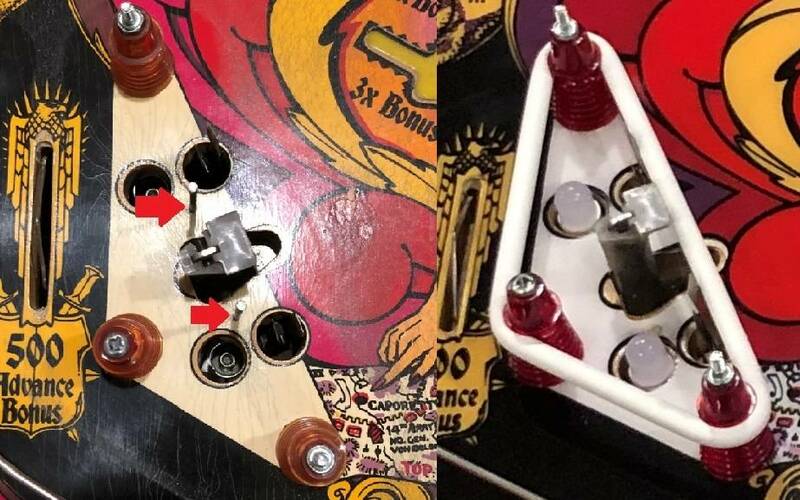 I would drill the old hole thru to the back, apply the HT and then use that small drill to make a small hole from the back of the playfield thru the HT. Ya, there's the bracket for the flipper assembly. I used a Exacto knife to enlarge the holes on my Hardtop after I installed it. I made sure the blade stayed sharp. My other hobby is building 1/24 scale model cars so I have a lot of experience with those knives. Since you have the flippers off I would go ahead and remove that bracket. Put a toothpick in the misaligned hole(s) on your pf. Break the toothpick off just above the pf surface. Put some paint on the end of the toothpick, then while the paint is still wet carefully lay the hardtop down, aiming for your "final alignment". The wet paint should mark the underside of the hardtop where its new holes need to be. 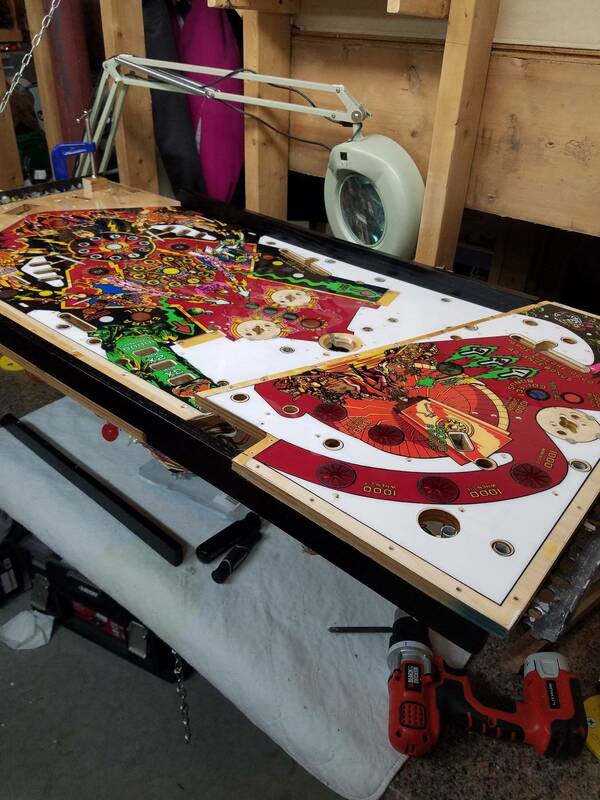 With the hardtop off, line up a sheet of paper perfectly to the corner of the playfield and mark your holes. Then put the hardtop back down and put your paper template on top and mark the holes through to the hardtop. I'm anxiously (yes I mean anxiously and not excitedly waiting on two as well. Not a peep on anything to date so hopefully you get some insider info on this for us. 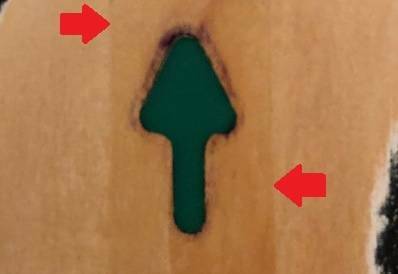 What kind of Dremel tool bit do I need to use to widen out the hardtop screw holes that don't line up with the playfield holes? All I have are cutting discs for my Dremel so I need to buy an accessory kit, but I'm not sure what to look for. What do you guys use? bits like these worked well for me. Oh definitely have a shop vac and some compressed air at the ready. Also wear a mask so you're not breathing fine plastic particles. I too was wondering the ETA for Pinbot? 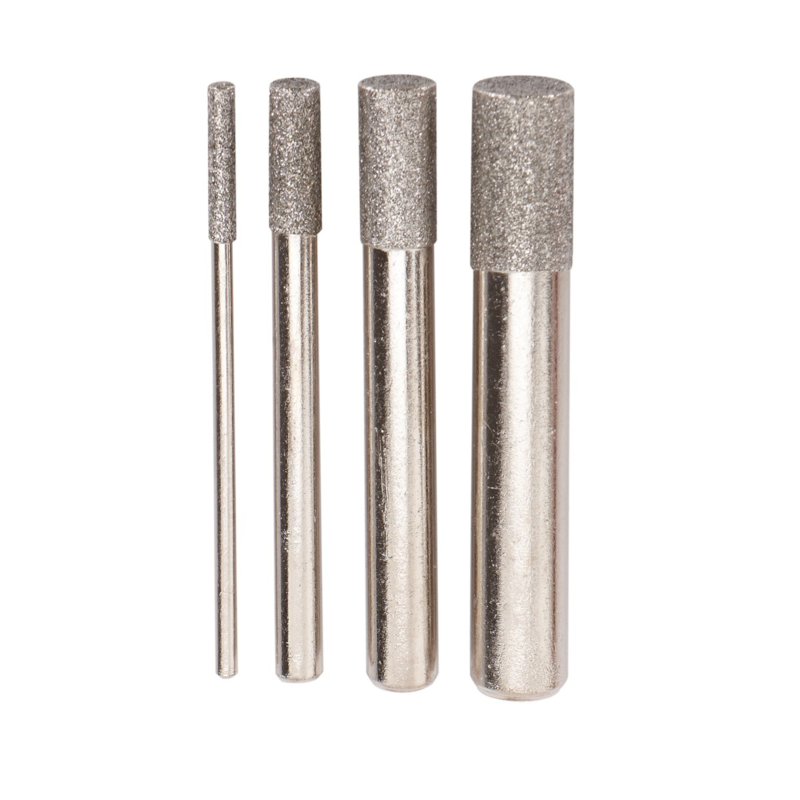 I am just curious how well the pin point soldering tip that nobody seems to use would work for redoing some of these small holes? Also when is Flash going to be ready ?? I used a scalpel/exacto knife also to fix holes, it worked perfect. Any chance on a Hardtop set for Elektra? At least the upper playfield and optionally the lower one. Those are usually wiped out on many of those games. Bring on SoF! I have started the series! Allow me to show off this product!